McLaren Automotive has announced its backing for the 2018 Telegraph UK STEM Awards that highlight science, technology, engineering and maths-based careers. McLaren Automotive is supporting the automotive technology category to emphasise the importance of STEM careers. The Awards – now in their fifth year – are aimed at talented undergraduate level students and showcase the company’s constant drive to hire the best talent needed to develop the next generation of world-beating sports cars and supercars. For talented and ambitious students, the Awards provide a rare opportunity to present their bright ideas to some of the key decision-makers at one of the world’s most exciting car companies. To enter the McLaren Automotive-backed automotive technology category, McLaren’s judges have set students a challenge linked to the rise of connected cars. While vehicles are becoming ever smarter and more connected, McLaren owners will always love the thrill of driving. Students will need to come up with ideas for how technology can be used in McLaren’s future luxury cars in a way that ensures they continue to engage customers in the entertainment of driving. The winner of McLaren’s automotive technology category will go forward to compete to be crowned the overall UK STEM Awards winner, with a chance to receive a grand prize of £25,000 at the prestigious final to be held in London next summer. 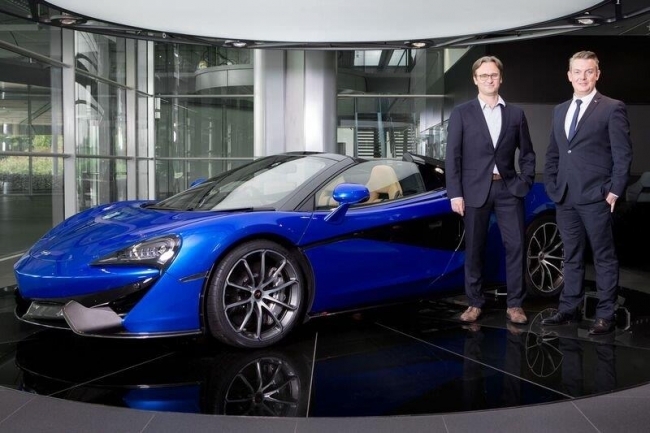 Previous winners of the McLaren category impressed judges so much that they were offered permanent positions at the company’s world-renowned global headquarters in Woking, Surrey. Judging the McLaren category are Paul Arkesden, Head of Engineering for McLaren Special Operations (MSO) responsible for product development at McLaren’s bespoke operation; Simon Lacey, Head of Advance Engineering for McLaren Automotive, who creates and develops game-changing technology for future cars; and Dr Caroline Hargrove, Technical Director for McLaren Applied Technologies, McLaren Automotive’s sister-company within the McLaren Group, that helped to develop the hybrid powertrain of the McLaren P1™. Full details of how to enter the McLaren Automotive category of the 2018 Telegraph UK STEM awards will be published in The Sunday Telegraph on October 1 and on the Telegraph website at www.telegraph.co.uk/STEMawards. After the February 19, 2018, closing date for submissions , the trio of McLaren judges will shortlist up to five of the best entries based on what they feel are the most creative and innovative ideas that meet the challenge. Those who make it through Paul, Simon and Caroline’s expert scrutiny will then be invited to the McLaren Production Centre in Woking, Surrey, where the company designs, develops and hand-assembles its cars to present their ideas in person. After that they will get an exclusive, behind-the-scenes tour to see at first-hand the work of some of the company’s 2,100 strong workforce. McLaren’s involvement in the Awards is part of its long-term commitment to encourage the uptake of STEM subjects. That commitment includes a network of McLaren STEM Ambassadors who regularly visit schools, colleges and science fairs, as well as support for schemes that reach younger age-groups, such as the recent BBC Live Lesson on physical forces that was broadcast live from the McLaren Technology Centre to primary schools across the UK. Mike Flewitt, Chief Executive Officer of McLaren Automotive said: “We’re delighted to support the STEM Awards and for McLaren Automotive to back the automotive technology category. Our judges have set students a challenge that is both stretching and exciting but also one that is very relevant to a forward-thinking company like ours that is about creating the ultimate driving experience and enabling that through the clever deployment of technology,” .